The blossoms, soft wind and shiny day make us all cheerful and light. The summer has always been the time to try new things and add to our adventure memories together with the loved ones. When talking about loved ones, dogs come on the first line. We like their company as much they like ours. Summer is a very good time to celebrate this bond. There are a number of things you can do different this summer with your fur buddy. It's hot and your pup loves water, what would be more fun than a swimming! If you have kids, fun is double. Take them to nearby pool where dogs are allowed. It can be one day thing or you can have this fun daily or according to your schedule. The water in the swimming pool can cause infection in your dog's ears. Be preventive about it and don't forget to clean it afterwards. If it stays, take him/her to your vet. Even when your dog knows how to swim, sometimes there's a risk of them falling into the pool and drowning. They panic in this situation which causes them to inhale water. So, be very attentive to them. Dogs are kids are attracted to movements, this is what makes them enjoy the back and forth of tide. If you live nearby a sea or a ocean, it's an fantastic idea to take your fur baby to the beach, of course, if it is dog friendly. Make them comfortable with the water and play with the tide together. Play with the sand. It's possible to get dehydrated while playing with the water. Make sure to bring a bowl and drinking water for your pet. Talking about water, using sprinkler is a cheerful play for dogs. The best thing about this is you don't have to go far, but still can have a good day in your backyard with your kids and pups. They will love it. To make it more fun, you can add music to it. Both of your dog and kid can be exhausted by too much of running around. Stop them in betweens and make them take a rest for a while. Take care of their meal too. Usually the parks in neighborhood are dog friendly. Take a break a visit the park with your friend. Play fetch, take a walk or rest. Your dog might enjoy the company of other dogs coming with their parent, as well. Pets also get sunburn. Don't go to the open park if the sun is too strong. Choose a spot with shadow if possible. Consult your veterinarian and find the suitable sunscreen for your pup. Apply it to the exposed area including his/her nose before you go out. Who doesn't love to eat out every once and then? Plan a dinner with your family, by family I mean the whole family. Select a dog friendly restaurant. These restaurants usually have enough space for you, your human and fur companion. Most of their service include a separate bowl of water at the beginning for your friend. Some might include other compliments too. It might not be a good idea to go on the dinner if your dog is hyper active or doesn't follow your command. It might create an awkward situation for you and the restaurant staff. Stay in a hotel is always a good package for vacation. It's more fun if your pet is with you and you don't have to worry about him/her while you are on vacation alone. Find a pet friendly hotel and start packing. The service both of you get, the swimming pool, the park all worth it. Again, you will have to be cautious about your dog's behavior and hyper activity. You might also have to fulfill some of their requirements. A camp on the open space with the flavor of nature n the environment and you are accompanied by your favorite friend, your dog. Isn't this a dream come true? May be this summer is the time to make dreams come true. Beware of the wild life. It's night time and your dog is in open, so take enough precaution to keep your dog around. It will not be a good picture if s/he goes of your sight. Find a trail somewhere near you where can hike with your dog. It is only suitable if your dog is in good health and is the one who likes walking and climbing. It will strengthen your bond to higher extent. Make a list of what you should take on the hike, plenty of water, food, first aid box and like. High temperature can give your dog sunburn and hypothermia (heat stroke). So, take plenty of rests and don't walk on the high temperature if your dog is not feeling good. Organize a dog party or a party where you all can bring their pets. Organize dog games in your neighborhood. Or plan a dog bath day at your locality. Devote a day for your pets and celebrate it together. Some pets might not get along, manage them. If you need permission for these activities, get one. Make it all about the pets. Dogs have been our best friends from centuries. They have been with us in our joy, grief and troubles. They have been the reason for our happiness. They can be taken as the definition of unconditional love. The welcome they offer to us every time we come back home is beyond the explanation of words. Their love, care and warmth always restore our faith. We all can agree on the fact that dogs have given us a lot. Why not thank them by giving them a productive gift this best friend day, a good health. According to a study by Association for pet obesity prevention, 56% of the pet dogs in usa are overweight in 2017. Among them, 19.6% are suffering from obesity. Overweight is not only the problem in itself but also the cause of many problems in both humans and animals. Well planned diet, proper exercise and regular health checkup is the key to healthy pets. You can be preventive about your pet's health and overweight issues, prevention is always the best way to deal with the problems. But, what if your dog is already overweight? Now it's the cure time. When it comes to reducing weight, the first thing that comes in my mind is water therapy. Water therapy, also known as hydrotherapy, is a technique of losing weight by the use of water. There are two techniques within the water therapy: swimming pool and underwater treadmill. In swimming pool, the dogs can play around freely whereas underwater treadmill is more of a focused therapy which is usually used with a targeted amount of weight to be lost. The water is denser than the air, thus making it 5 times more effective exercise. 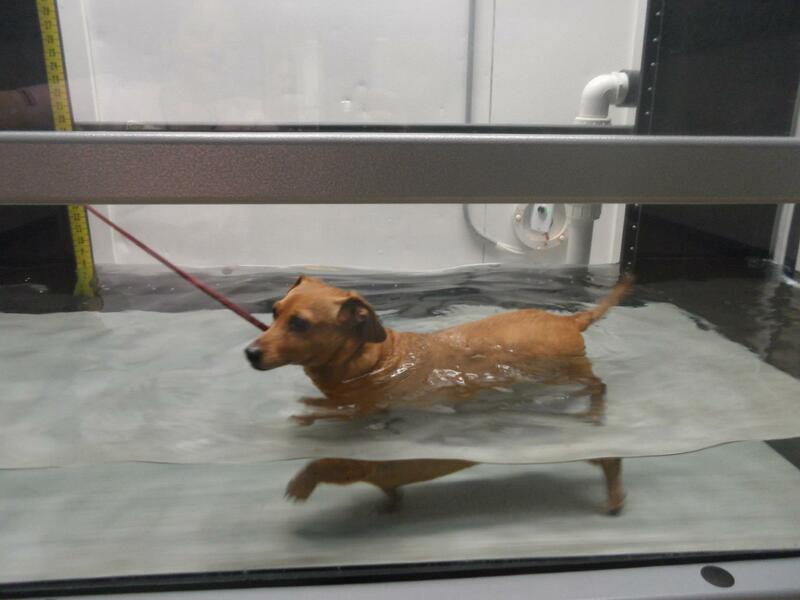 The dogs can lose more weight through water therapy in very few time span. If trained properly, they love swimming, making it a fun and they won’t have the burden of the feeling of exercise. Along with weight loss, water therapy has many other perks for dogs. Regular water therapy helps maintain fitness, strength and condition of body. Being in shape and health reduces most of the future medical costs. Water buoyancy makes it possible for dogs with joint problems to exercise without any pressure. It is very useful for joint and limb problems. Water therapy is a healer after surgery or injury. It makes it easier for the muscle mass development and muscle strength in necessary body parts. Water therapy, usually warm water, improves circulation and lymphatic drainage. It reduces swelling, increases mobility and relaxes the muscle. It increases the metabolism in body. Because of this, all the food consumed get properly digested and the nutrient reach all the necessary parts of the body. Urban pet hospital and resort is well equipped with in-ground endless pool with swim current and aqua paws underwater treadmill. Our swimming trainers train dogs in regular basis and perform special weight loss programs, too. If you are living in Urbandale, Central Iowa, we are here for you. You can contact us at 515 727 0607. Wish you a happy best friend day. How to Prevent Pets from Fertilizer Poisoning?